Girls unite. 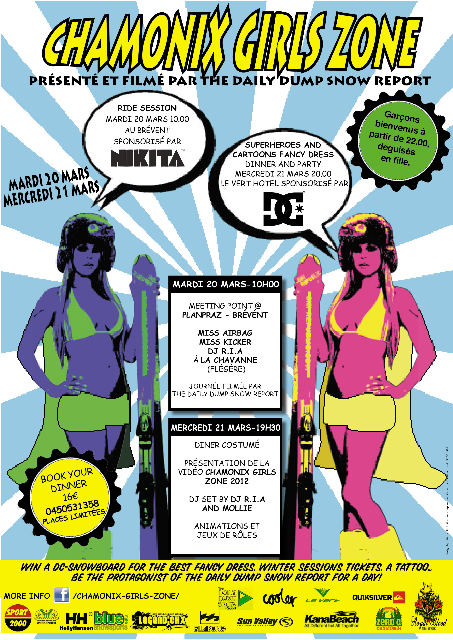 The Chamonix Girls Zone is here and will be taking over Chamonix on the 20th and 21st of March this month! It´s a free to participate is designed for chicks that love to shred, no matter what the level. It’s a day leave the boys behind and to embrace a snow-fueled female fiesta!! It’s a chance to meet cool, new girls, learn from each others riding and maybe throw down a few new tricks! But, most of all it’s about having an awesome day under the spring sun in the snow-slush with like minded ladies. The idea was conceived last year in conjunction with International Women´s Day. Elena Lopez and her bestie wanted to seek out more girls (like them) that immerse themselves in the winter paradise, that is Chamonix. The response to a ‘Girls Only’ event was overwhelming, and as a result turned into a raging success. Post event is was glaringly crystal-clear the girls of Chamonix had been waiting way too long for the chance to hit the mountains together! A full day riding together at Brévant-Flégère with competitions, fancy games, and HEAPS of present. 10.00H – Meet at Brevent Middle Station for riding session. Become Miss AirBag or Miss Kicker! 14.00H Price giving La Chavanne w/ DJ R.I.A Win 3 amazing packs by NIKITA plus other cool prizes. We at The Daily Dump Snow Report will be filming the day to create an exclusive edit of the day! And – I’ll be wearing the new seasons jumpsuit outerwear onsie – thanks Nikita – You rule the world. Le Vert will put on a special dinner menu for the girls, then it’s The Super Heroes Fancy Dress Party! There will be fun competitions, awesome prizes for the best dressed and lots of surprises! The boys are welcome to the party after 20:00, but only if they are dress up as a girl!!! Get in amongst boys.